We've been working hard to create a range of cosmetics that are great quality, stylish and affordable. It's proving to be really popular with customers, so we've updated the range with some new additions and great new tones that are perfect for creating fabulously festive looks. 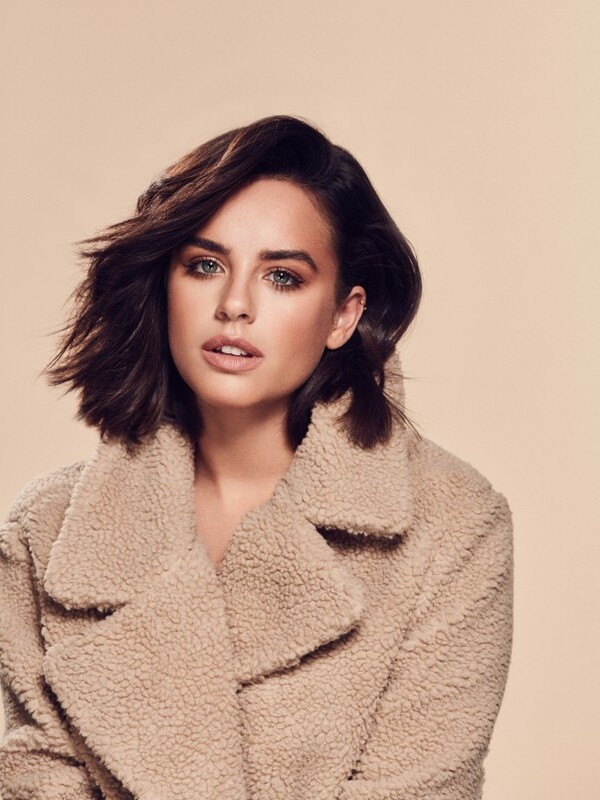 And now I'm really excited to say we've teamed up with Coronation Street actress and Strictly Come Dancing star Georgia May Foote to show them off! This season we've focused on addressing some key product range gaps by launching our first Setting Spray – currently on Rollback for just £3.50 a bottle. It's vitamin enriched with acai extract, aloe vera and vitamin B3 and perfect for making sure your party looks stay in place through the night! We’ve also introduced our Glow Beam Liquid Highlighter Drops which come in two shades and have a lovely dewey finish. Find them in selected stores and online now for £3 a bottle on Rollback. We also wanted to ensure that we launched some new autumnal shades in our popular products that we know our customers love already – like the Matte Liquid Lipstick in Espresso for just £3. It's great for a bolder lip this festive season. There are also new shades in our loose eyeshadows, the eye shadow palettes with eight shades, liquid lipsticks, gel nail polishes and our bronze highlighter. We wanted to make sure that there's lots more choice to inspire our customers to try new looks this season. As a team we chose the new shades because we understand that our customers are looking for more muted shades at this time of year. It's also about expanding our repertoire and making sure there are shades that suit a wide variety of skin tones and complexions. We've worked hard to make sure our products are both on trend and good quality. We do our best to develop products that are appealing to all and we've really concentrated on making the packaging Instagram-friendly so our customers can be proud of carrying our range in their make-up bags and will want to show it off! My personal favourite is definitely the bronze highlight. I use it daily so I’m really pleased we’ve brought out a lighter version in Champagne for my winter skin! I also love the Cosmic Blush, particularly during the winter months, as it definitely adds a healthy glow. For me Christmas is all about sparkle so if you're looking to try something new this year I'd recommend anything with a bit of glitz! I love our metallic liquid lipstick. Espresso is a beautiful dark chocolate colour with a nice sparkle to it. It's long lasting too, so great if you don’t want to reapply all night long. I’m also a big fan of our loose eyeshadow in Orchid, which is new to the range this autumn and currently just £2.50 a pot. It’s a lovely pink champagne colour and it can be applied dry or mixed with water for some extra gloss. Also our new nail polish in Twilight is a lovely glittery deep blue and is great if you want a seasonal nail look without going for the traditional berry red. We’ve loved working with Georgia on these autumn winter looks, and we've had really positive responses from the campaign already – including The Sun who said "We think it's time for a trip to Asda...". It’s great to see, as ultimately we want to create a range our customers like using and can rely on to deliver their beauty needs. We’ve also had a lot of positive feedback from make-up artists who have used the products, particularly for our shadow palettes, as they’re very pigmented. Georgia obviously looks beautiful in all the looks created with our cosmetics range – but they're not complex! It's about creating the right base and then highlighting your features. It’s also good to experiment with colours that you wouldn’t usually consider, as you may be surprised by the results! I can definitely vouch for this from personal experience – I’ve used some of the brighter shades myself from the collection and I loved the end result! Working with Georgia has also added a touch of fun to the collection – we'd love for our customers to be inspired to recreate the looks and experiment with the products we have. We have many more products launching in spring next year. I think choice is key when shopping for cosmetics and I want our customers to be inspired when they shop from the George cosmetics range. We're currently working to grow the number of foundation shades we have as well, which I'm very passionate about, so all I’d say is watch this space!